I've been decorating only just a little, and I wanted to share this little vignette that I created. The topiary got a fresh start this year. Last year he was traditional orange colors, but I am going for more muted neutral tones now and so, I grabbed a paint brush. I painted the top pumpkin off white colors, and the bottom mocha. When he was completely dry, I sprayed him with a clear matte spray to protect the finish. I added burlap leaves and a new vine with neutral berries. Oh and I painted the clay pot he sits on, too. I'm super happy with this project. Now you know you can paint those plastic pumpkins in case you can't find one in the color you like! 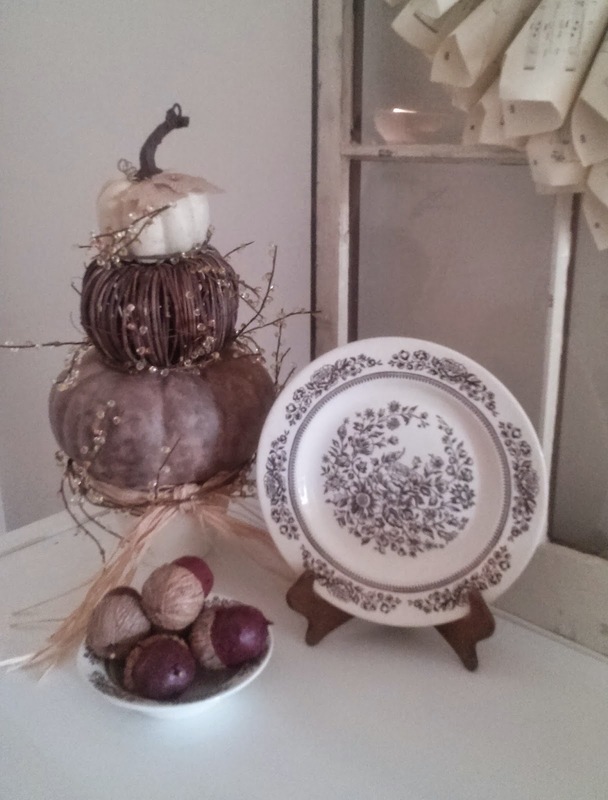 The little plate was a thrift store find and it just so happened I had the saucer and bowl. Who knows, maybe I will find more pieces, but in the mean time, he makes a great addition to my little autumn vignette!